Those of you who follow me on Twitter or Plurk already know this: a bus hit my car on Saturday. The car was parked and we weren’t in it at the time. It hit the rear of the car, so now there’s a dent and some scratches. As a thank you for the neighbor who saw it happen and got all of the details for us, I’m baking. 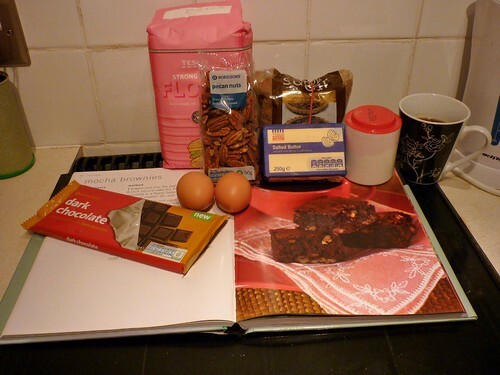 Tonight, it’s mocha brownies from the book I got for Christmas from O’s sister. And tomorrow morning I’ll bake some peanut butter cookies. We’ve got to head out to O’s parents’ place to give O’s dad his birthday present, so I’m dropping off the baked goodies then (we were parked outside of O’s parents’ place when the bus hit the car). I’ve never met the neighbor, but his dad was my driving instructor, so it could be an interesting visit tomorrow.